EverYuth Orange Peel-Off Skin Vitaliser is an amazing face pack and a wonderful way to make your facial skin look fresh, rejuvenated and glowing almost instantaneously. Now Everyuth has come up with a better version of this orange peel-off face. 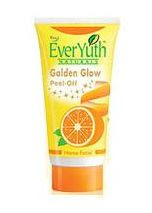 It is given a fancy name of EverYuth Golden Glow Peel-off and Everyuth claims that this product with its glitter particles and orange extracts, stimulates blood circulation and oxygen supply to the facial skin and peels off deeply embedded dirt, grime and bacteria from within the skin pores. This 3-way action supposedly gives your face an instant golden glow, thus providing a perfect home facial, without burning a huge hole in your pocket. The different packs of 90gms, 50gms, 30gms, and 8gms are priced at Rs.90, Rs.60, Rs.30 and Rs.12 respectively. You can watch the television commercial of this product here. Orange Peel Extracts:Refresh, condition, lighten and moisturise skin. Natural Minerals : Make your skin smooth, generate new cells and give a golden glow. Skin Vitamins A, C & E : Protect skin from the sun, pollution and premature ageing. Very good to know, thanks for this!!!!!!!!! Make a paste from Almond raw milk ,apply your face and wash after dry .These pack make your skin glowing . 6-Drink 10-12 glass of water everyday. Water removes the toxins from the body this mask set on your face for 30 minutes for a glowing skin. Mix half-a-cup honey to your bath water for soft and smooth skin. For a soothing body pack, prepare a paste of mint leaves and almonds.